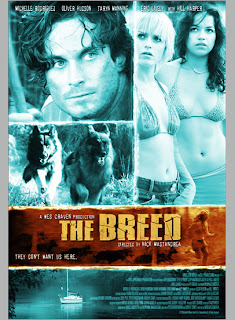 The Breed is an okay horror-thriller. Nicki (Rodriguez) and her friends go to a secluded house on an island to party before college exams. In the beginning it's all fun and drinking, but then rabid killer dogs come after them. Can they escape? What's bad about the movie is that you don't feel for any of the characters. Harper's role is the token black guy. All he wants to do is drink even after the dogs have attacked. The acting is decent though. Rodriguez puts in a good performance and she does well with the action scenes. Manning was better in Hustle & Flow (2005) and Dandelion (2004). The dog special effects work sometimes, but story-wise, they come out of nowhere and there's no end to them. The movie has been collecting dust and cobwebs for awhile now. It was slated for a theatrical release, but it's better off on video.